Laptop collectors: if you're allowed to collect just one laptop, which one would it be? That said if I were to collect one laptop... it'd be a T500 modded with QX9300 and a very bright LED WUXGA. Hehe...queue Corey Hart! I wear my sunglasses at night so I can so I can use my Toughbook! That's an impressive list of mostly very unique laptops, but if you can pick only one which one would it be? A very good question, which is kind of why I made that list. If it wasn't for my country being ridiculous in terms of paying shipping from the US, it would be the Pavilion ZD8000. I remember these. They were the true mobile workstations, unlike the "mobile workstations" that are only 15.4" or 15.6". Too bad back then the highest resolution for widescreen 20" LCD panels was only 1680x1050. If someone resurrects this form factor today, it would have 3840x2160, which would be perfect for a 20" laptop. And it would almost certainly be lighter as well, like 10 lb. I hope so, it would be quite interesting to have a 20" laptop to lug around. Hopefully, along with better specifications than a average 17.3" laptop would have. Somehow I was very attracted to Toshiba's equivalents, namely the Libretto series. But I ended up getting Sony's P series, which was also pocketable. You were interested in the Libretto line-up? Woah, guess I wasn't the only one. I also wanted a Libretto (70CT) for quite a long time before my interest died out, was a great sub-notebook for its time though. I do believe that you made a good choice to get Sony's P series instead of Toshiba's Libretto. Performance-wise that is, considering that the Libretto line-up concluded with the U100/U105 and with the limited edition, dual-screened W100/W105. Again, I can't do 720p YouTube without frame skip on a T601. I'm pretty sure 1080p YouTube is a requirement for any *device* to be called modern - as any $100 Chinese tablets and any modern smartphone can handle it. The T601 can't. I'm not saying it can't be useful for some people - but I'm pretty sure for the vast majority, it's just too outdated. My T601 T9300/8GB/256GB SSD plays 720p60 Youtube videos without single frame drop. It also plays 1080p30 , again without frame drops. Even my T7300 based X61 plays 720p videos without any frame drops. Either we are watching different Youtube, or your T601 is broken. Back on topic: it's a hard choice, but if I had to choose, I would collect T9300 based X61 SXGA+. If it wasn't for my country being ridiculous in terms of paying shipping from the US, it would be the Pavilion ZD8000. I am surprised this is the one you would have picked, as it seems to be the least special on your list. Panasonic had a 20" 3840x2560 tablet: https://shop.panasonic.com/home-and-off ... B5025.html . I wish there was a clip-on keyboard for this tablet that would convert it into a laptop! If we find 17.3" too small, Asus has an 18.4" 3840x2160 laptop: https://www.asus.com/us/Laptops/ROG-GX8 ... ntel-Core/ . It weighs 12.56 lb. You were interested in the Libretto line-up? Woah, guess I wasn't the only one. Oh yeah. I first saw one in person about 15 years ago, when I had a colleague from Japan who used his Libretto at his desk at work, every day. I couldn't believe that he wouldn't even hook it up to an external monitor. A couple years later I saw a newer model at a store in New York City, CompUSA I think. I also wanted a Libretto (70CT) for quite a long time before my interest died out, was a great sub-notebook for its time though. Well yes, it is the least special out of the rest listed out on my list. Though there are some reasons why I would not want to collect the other machines, mostly due to personal opinions, drawbacks, and upgradability that I would consider when picking the only laptop I would ever collect. Fascinating, a 20" tablet sounds kind of overkill and... oh boy the price tag. I also didn't know that the 18.4" laptops were still around, good to know that there are better options than 17.3". I never knew that someone would actually use a Libretto for work, that is something I would not expect from a Libretto buyer. I guess it was versatile in a way, funny enough. Woah, quite a choice you have made to switch from the P series to the ThinkPad 8. Although, it is understandable why you went away from it. I had the same experience as you did with your Sony, but instead with my Fujitsu LifeBook U1010. I had to always make sure that I brought the charger along, or I would be left with a paperweight that ran out of juice. I have a hard time believing a T601 would even be okay for simple and basic home user tasks these days such as Netflix. Again, I can't do 720p YouTube without frame skip on a T601. I'm pretty sure 1080p YouTube is a requirement for any *device* to be called modern - as any $100 Chinese tablets and any modern smartphone can handle it. The T601 can't. I'm not saying it can't be useful for some people - but I'm pretty sure for the vast majority, it's just too outdated. I can pretty much guarantee that you'll find dozens of folks running *61 platform around here who will testify that neither Netflix nor 720p YT are a problem within W7 realm on a *properly set* system. It would be a 15 inch T601 frankenpad with SXGA+ daylight LED kit modded screen (UXGA is just too small for me, I have pretty bad eyes), Nvidia nvs140m variant with lot's of modifications (T500 heatsink, BIOS mod for all the usual goodies + nvidia undervolting, and modded firmware for lover fan speed levels as the factory levels are insanely loud). This is a machine, that is on the top of my list, both for collection purposes, and for daily machine as well. Also want to mention, that right now I use a normal T60 with most of the mentioned mods applied, and even this machine is still perfectly fine for my needs, so it really depends on what someone expects from them, and the user habits too. I've been always impressed by the x series. I simply like the idea of having an extremely portable device with a docking station. Now I have a pile of functional thinkpads, no room and don't want to sell any. Last edited by WarhawkCZ on Tue Oct 16, 2018 11:17 am, edited 1 time in total. I also didn't know that the 18.4" laptops were still around, good to know that there are better options than 17.3". This Asus ROG GX800 might be the only 18.4-incher still available. For a while there were a fair number but all were only 1920x1080 or even 1680x945. Hopefully more 18.4" UHD laptops will become available. The Asus GX800 isn't for me because it's way too heavy and huge. With the bezel minimized, an 18.4" laptop would be about the same size as some 17.3-inchers, and I can visualize myself owning one. Compared to the Sony P, the Thinkpad 8 was faster, had a larger screen and higher resolution, had WWAN, and lasted ~6 hr on a single charge. I traveled with it a couple times but eventually decided that it's still too uncomfortable to use. So about 1.5 years ago I upgraded further to the Microsoft Surface 3. I have never liked docking stations because they take up so much desk space. To maximize desk space I use desktop computers: the computer on the floor, the keyboard on a slide-out tray underneath the desk, and the monitor pushed all the way against the wall. Well, this is just individual. Also, some docking stations (e.g. for lifebooks) were way better size-optimized than those for ThinkPads. This is one of the reason why my GF does not want to get her s7220 away. That thing just refuses to die and has a very nice and compact docking station. I use two external screens, external keyboard and mouse so dock is just about the right solution. My company laptop is dell and it has a nice stand for an LCD screen where the docking station goes below. It does not take much space at all. Nevertheless, I like the idea of TB3 and a single cable. However, I am not yet convinced that this is going to work under all circumstances. Back to the original question, I would collect the 17" Thinkpad laptops. W700 (+/-DS), W701 (+/-DS), P70-P72. At one point, I had a W700, W701, and P70. If only the W701 had an IPS display, it would be the perfect machine, even in 2018. Side by side, the 1200px W701 vs even the 1080 on the P70, combined with the classic keyboard was a HUGE difference. My W701 had a reddish tint at anything but a dead-on straight viewing angle. But today, this is the era of IPS 4k and Retina displays, and the TN panel doesn't cut it. That's one downside. The other downside was that it is HUGE. It doesn't fit in any Pelican case that can fit in carry-on on a plane. There is a noticeable size difference even between the W700/1 (massive) and the P70/1 (less massive). I was also a huge fan of the G40-series machines. In 2006-2007, we set up an internet cafe in Iraq using G41's. But now looking back, they were only 15" screens and not 17", so they would not fit my criteria of collection. It troubled me that people preferred to use external mice instead of the built-in TrackPoint. Today, I only have the W700. It runs Win10. My son loves it. 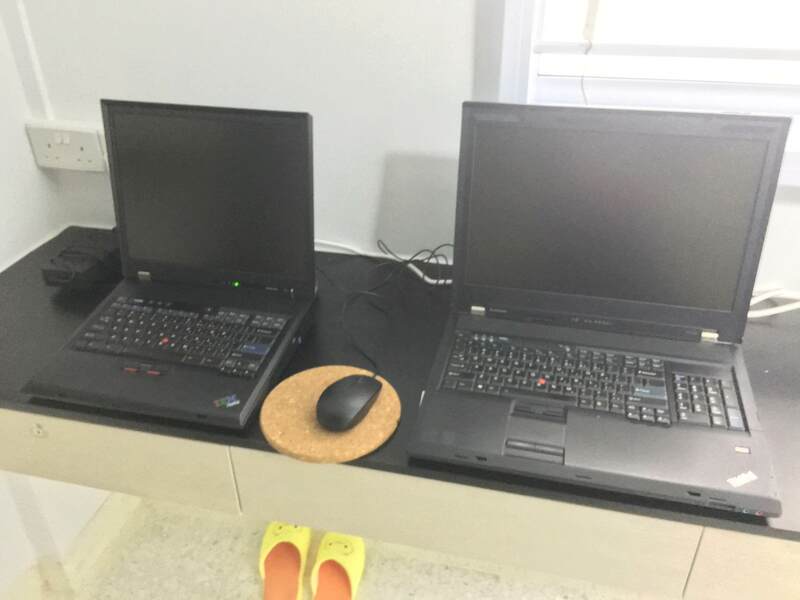 Found a photo of my W701 and P70, right before I sold them. The size difference and the screen qualities stand out. Not pictured, is the 15" T43p to the left of the P70. It is the same height, and it is my daughter's laptop today. I also have still have a W700, packed away somewhere, with the same dimensions as the W701. It has an LCD display with blemishes. Interesting comparison there, I thought I would never to see a W701 and a P70 together in one image. As a token of my appreciation for posting that image, here is a G50 and a W700 positioned side-by-side. I don't have a good camera at the moment, but it should do. My choice is IBM A21p. It supports Windows from 95 up to XP (has all the drivers for all of them), yet sound works in pure DOS, very upgradeable and expandable especially with the dock. A31p lacks SB support in DOS, otherwise also an outstanding machine. Last edited by Bondi on Fri Jan 04, 2019 11:05 am, edited 1 time in total. Wow that's a very favorable feature I never considered before. I do still play DOOM and DOOM2 now and then, so the full DOS compatibility including sound is helpful. And of course the 1600x1200 resolution makes the A21p still fairly useful today for text-based work. I currently have a beige Dell OptiPlex desktop with Pentium MMX (either 200 or 233MHz, don't remember which) that I use occasionally for DOS, Windows 2000, and other old programs. It doesn't really take up any space because it sits on a cabinet that's roughly the same size, and it piggybacks on my main desktop computer's monitor. But an A21p would be a more fun "toy", is mobile, can run Windows XP much better, and consumes less electricity than a desktop + 32" monitor. I will consider getting an A21p! I am very curious whether its VGA output can drive 2560x1440 on my 25" QNIX QHD2410R, and 2560x1600 on my 30" Monoprice 10734. Unlike nearly all other QHD and WQXGA monitors, these two monitors don't cripple their VGA inputs to FHD or WUXGA. A QUESTION FOR EVERYONE: do you know if the A22p also fully supports "pure" DOS? As for the max resolution, found somewhere that it's 2048x1536. But still has to be doublechecked. The resolution limit for VGA outputs is always stated as 2048x1536 or less, but on my QNIX QHD2410R and Monoprice 10734 monitors I have had success getting 2560x1440 and 2560x1600 from most VGA ports I've tested, even ancient ones.